I'll be teaching a SPRING class at our local Community College, TMCC SILVER CLASS. Discover the Thrill of Painting outdoors! Learn how to use thumbnail sketches, mix colors from a limited palette and experiment with abstracted realism!! April 18-May 9th. ​three outdoor pleinairs to local spots! Limited to 12 students. wdce.tmcc.edu or call 775.829.9010 for more information. "...the mountains are calling and I must go.." J.Muir. My exhibit is dedicated to John Muir, American naturalist, conservationist and "father of our national parks" who devoted his life to saving special places. The 2017 solo show is September 1st thru October 30,2017 at the South Valley Library, Reno, NV.... Artist reception on September 16th, 3-4p.m. Enjoy my show Video now on YOUTUBE.!! Call the South Valley Library @ 775.851.5190 for hours. "ART ON THE GREENS".. the 3rd Annual ARTOWN2017 event proudly presented by the Arrowcreek Artists Guild at the Club at Arrowcreek Golf Course on Sunday, July 9th...11am- 6p.m. ..with more than 30 artists, it will be a feast for the eyes. Come early for the best art choices! POP-UP ART SHOW at WEST ELM, a furniture and accessories store located in the magnificently renovated post office.. 50 S. Virginia St...in the heart of downtown Reno. ..happening in December.. 324.0192. ​ the COLORS of SNOW....! 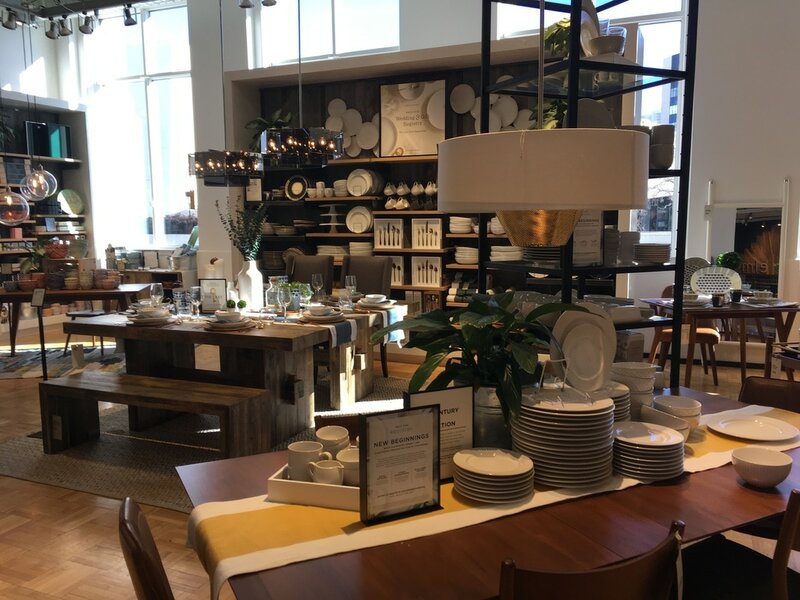 Stop by and see this beautiful space. "TRUCKEE MEADOWS REFLECTIONS" Jan 10th thru March 25, 2017.
celebrates the TRUCKEE RIVER with more than 40 original artpieces!!! Please join us at our ARTISTS RECEPTION on FEBRUARY 25th.. 4-7p.m. LOOKING OUT--SEEING WITHIN. Group show at the Unitarian Universalist Fellowship of Northern Nevada, Reno. Each artist will exhibit 2 paintings of Nevada...an abstract along with a realistic/impressionistic one of the same location, showcasing how realism comes out of an abstract idea....or visa versa.! July 1st thru August 20, 2016. Artists' Reception is on Sunday, July 10th @ 11.45. IN THE OPEN 4. The Reno Tahoe PleinAir Painters present their 4th exhibit and sale at the METRO GALLERY in City Hall Reno, NV June13-July 29, 2016. 15 intrepid artists have painted outdoors together for the past 3 years! Meet these intrepid individuals at our Artists' Reception Thursday July 7th 5-7p.m. ​The 4th annual ART OF CONSERVATION. Nevada Land Trust fundraiser and sale. April 1st- April 30, 2016 at the Artists' Co-Operative of Reno. Artists' reception on Sunday, April 3rd 1- 4p.m. Contact the Co-op at 322.8896 or the NLT www.nevadalandtrust.org for more information. IN THE OPEN 3. the RENO TAHOE PLEINAIR PAINTERS present their 3rd exhibit and sale at the Northwest Library in Reno. March 5 thru April 23rd. Please meet our 7 intrepid painters who've been painting outdoors weekly for the past 3 years at our ARTISTS' RECEPTION on Saturday, March 26th 2-3p.m. "the mountains are calling and I must go." John Muir. 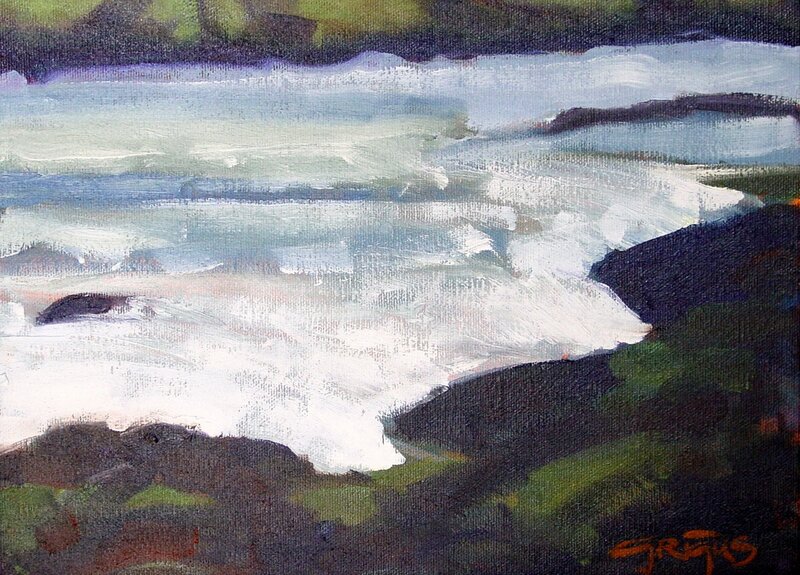 contemporary 'plein-air' landscape paintings by artist Carol Grigus. My annual Solo exhibit is dedicated to John Muir, American naturalist and conservationist, who devoted his life to saving special places.. .the 'Father of our National Parks'. At the Northwest Library Reno, NV January 10 - February 27, 2016. Please join me at my Artist reception on Saturday January 23rd 2-3p.m. TACHE DAO* *Much Blue Water. 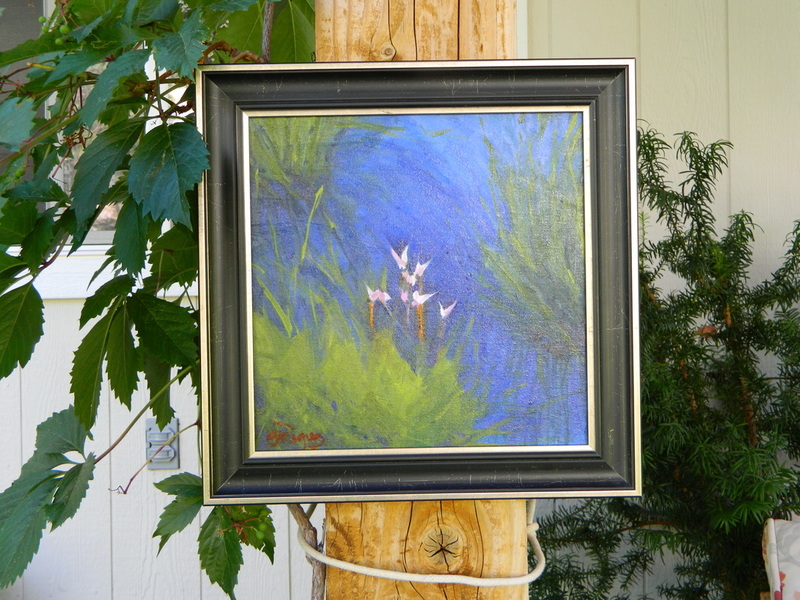 My contemporary pleinair oil paintings explore the BIG BLUE.. Lake Tahoe... and the Sierras in all seasons. next to Fanny Bridge. From the warm celedon shallows to turquoise and cobalt, then finally the cold indigo waters of the deep, Lake Tahoe continues to leave me breathless....!!! For more information contact www.gotahoenorth.com or call 530.581.6900. 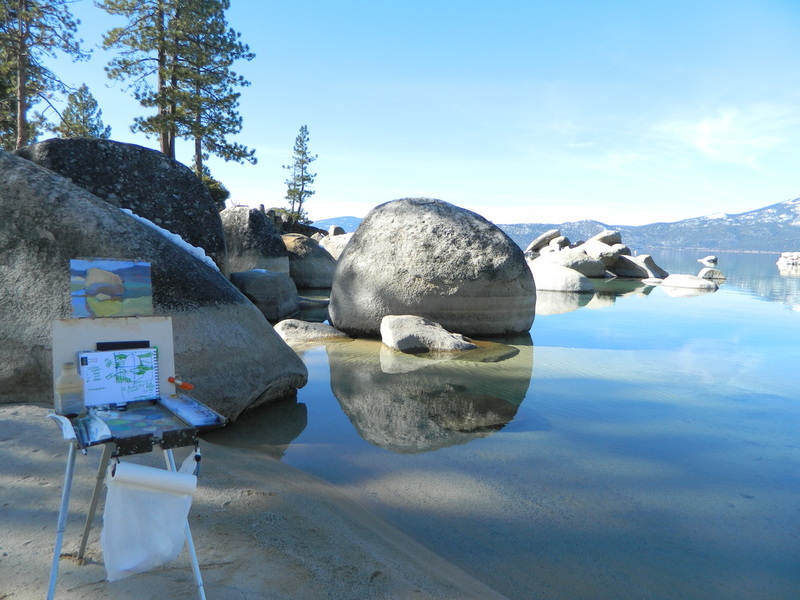 IN THE OPEN .... the RENO TAHOE PLEINAIR PAINTERs first of 3 art exhibits at the South Valley's Library, Reno, NV October 15 thru November 21, 2015. Please join us at our artists' reception on Saturday, October 17, 2015 3-4p.m. IDA'S ORCHARD (on left) is a 12x12" pleinair oil painting which is now at the library show along with another painting, SHOOTING STAR SPRING at the meadows.! "IMPRESSIONS OF PLACE V".......MONTREUX ARTISTS' SHOW AND SALE. Sunday, September 20, 2015. one day only!!. 2-6p.m. at the Montreux Country Club. I'll feature paintings from my SNOW series of the Mt. Rose area including Sand Harbor...the Taylor Creek Salmonrun.....the Carson River...and Sonora Pass.! 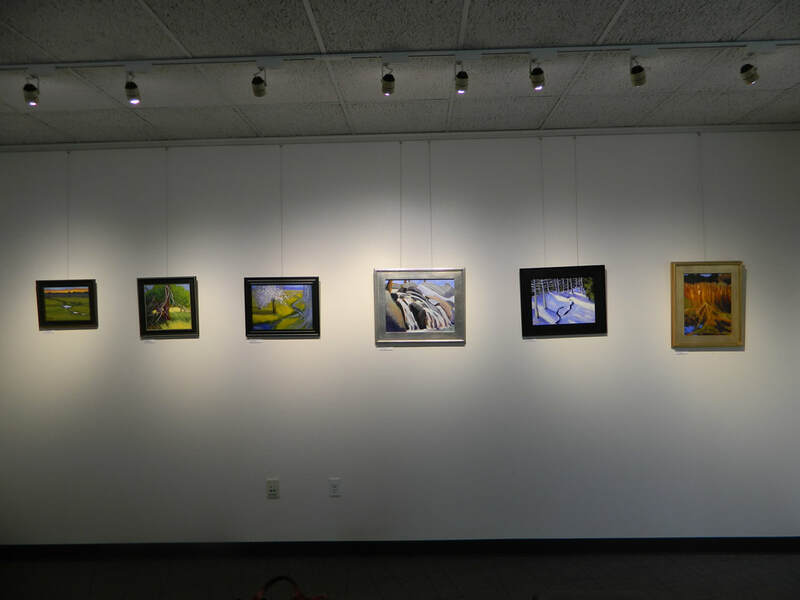 "A WALK IN THE WOODS" 3 artists exhibit at the MONTREUX Welcome Center. Reno, NV May thru August, 2015. Reno, NV. www.nevadalandtrust.org. Meet the artists reception on Friday, 24th..4-7p.m. OPEN SPACEs AND SPECIAL PLACEs: The Art of Conservation 2014. October 23-26, 2014. 2nd Annual Art Benefit Art Show and Sale. Sponsored by the NEVADA LAND TRUST. www.nevadalandtrust.org. at the beautiful May Museum and Arboretum in Reno, NV. Celebrate the beauty of Nevada thru the eyes of the region's most distinguished artists who donate a portion of their sales to Nevada's grassroots nonprofit organization... phone 785.5961 for hours. ARTOWN WILD NEVADA RECEPTION JULY 12, 2014. 4- 7p.m. 1360 Greg St. #111, Sparks, NV Exhibition thru July 31,2014. "50 YEARS OF WILD NEVADA" ART EXHIBIT & FUNDRAISER!! FRIENDS of NEVADA WILDERNESS was organized in 1984. In 1987 FRIENDS rallied support for the establishment of GREAT BASIN N.P. and in 1989 Mt. Rose, Mt. Charleston and the Ruby Mountains were added to Nevada's wilderness areas. 2014 is a special year for our Silver State, it's 150th anniversary, and FRIENDS 30th anniversary. During this 50th anniversary celebration of the WILDERNESS ACT of 1964, FRIENDS has invited NV artists to share their own experiences of the wilderness in their artwork. Please call 324.7667 for more information. www.nevadawilderness.org. 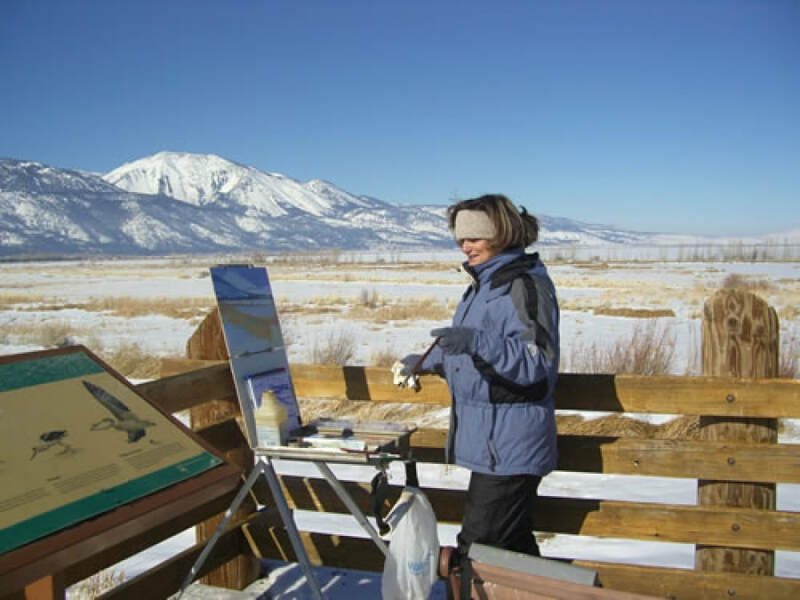 "PLEINAIR" PAINTing Demonstration at THE GALENA CREEK VISITOR CENTER , Reno, NV. 10-12noon ..Saturday, April 12,2014. I'll give a painting demonstration including techniques I use for painting outdoors..aka "en plein air". Please contact the Galena Creek Visitor's Center www.galenacreekvisitorcenter.org for more information. THE BANFF FILM FESTIVAL..APRIL 3, 2014.. 5.30p.m. at the Nugget's Rose Ballroom, Reno, NV. THE NEVADA LAND TRUST's ANNUAL FUNRAISER AUCTION. Several conservation artists,including me, will be featured at the Silent Auction before the films. THE ART OF CONSERVATION FOR KIDS!! Six special paint-ins for children will be held on July 19,2014 at the MAY Museum and Arboretum, Reno, NV. Sponsored by the Nevada Land Trust. November 14, 2013. 4-7p.m. Original Art, new magical characters and more. 3RD ANNUAL MARKLEEVILLE PLEIN AIR PAINT Markleeville, CA. and rivers of the Sierras of Alpine county, hope valley and Markleeville, CA. Saturday,June 29th, morning till noon, artists will paint in Markleeville. OPEN SPACES and SPECIAL PLACES: The Art of Conservation. a benefit exhibition and sale. July 19-21, 2013 at the Wilbur May Museum, Rancho San Rafael. Through this collaboration, artists are out painting project sites thru-out the state. Special paint-ins for children ages 8 and up will be held on July 20. Please call Ela at 775.851.5180 to register. parent/guardian participation necessary. Nevada Wilderness Society ARTOWN exhibit and Sale, July 2012. Nevada QUICKDRAW Plein-Air Paint Fundraiser and Sale, Scenic Nevada, Bartley Ranch, Reno August 2012. 5th annual Winnemucca Ranch Art Show: Hobson Gallery Reno 2012. DRAT: Dusty Roads Artists Trails. Travelling exhibit thru-out Nevada 2011- 2012. NV PALETTE: Scenic NV Art Gallery 2010. Annual MEMBERS SHOW & SALE North Tahoe Art Gallery, Tahoe City, CA 2010. North Tahoe Artisan's Gallery HolidayArts, Tahoe City, CA 2009. SMALL WONDERS Exhibit & Sale Scenic NV 2009. NEVADA KALEIDOSCOPE: six NV artists Paint Nevada. Scenic NV 2009. QUICKDRAW ARTISTS PAINTout for Scenic NV FUNDRAISER 2007 & 2008. TACHE DAO: Much Blue Water Exhibit. North Tahoe Arts Center Tahoe City, CA 2008. ARTISTS on the GROUNDS SHOW. Thunderbird Lodge Preservation Society, Lake Tahoe, NV 2008. RENOWN HEALTH CENTER: Healing Arts Permanent Collection. Reno, NV 2007. HABITAT for HUMANITY Art Auction 2006. PLEIN-AIR PAINTERS PAINT NEVADA ARTOWN Silver Legacy Reno, NV 2006. First One Woman Show: River Gallery Reno, NV 2003. ARTS & AUTHORS: Soroptimists of Reno Fundraiser Sale 2002-03. IMPRESSIONS OF PLACE: I II & III PAPON. the Plein-Air Painters Of NV River Gallery, NV 2000, 2001, 2002. IMPRESSIONS OF PLACE: the ART OF PLEIN-air Painting. We'll explore Nature using our paints....from the thumbnails to the canvas. Please use my contact form for more information. All material and images are protected by copyright. Carol Grigus 2009-2019.